Welcome! The third Wales International Film Festival (WalesIFF) will take place on 23-24 September, 2019 at the Gwyn Hall, Neath, South Wales. It will be open for submissions world wide from October 10, 2018 where competitors will be able to enter their projects into 24 different categories via FilmFreeway platform. 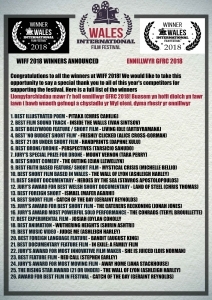 WalesIFF will be held over two days, and will screen over 30 feature, short films and animation projects with the Awards Gala held on 23 September at the Gwyn Hall, Neath. There will also be an opportunity for up-and coming filmmakers to network with industry experts and experienced Producers and Directors during the event as well as scheduled workshops with industry experts. As a non-profit organisation, WIFF has received generous support from its sponsors who have made it possible to launch the festival. Our principal sponsors are Gravells, Tanabi Group, Swansea University and The Welsh Factor. They have an incredible passion to see WIFF launch as a definitive platform for Welsh filmmakers to be able to showcase their work and compete at an international level. Their support has enabled the team to launch WIFF to help and promote the region’s filmmaking community over the next 3-5 years. For further information on Sponsorship please click here.